Viet Nam’s very own basketball league, the VBA League, is now into its second year. Young fans regularly pack out the stadiums, enthralled by the country’s latest sporting trend. Peter Cowan reports. Jaywuan Hill receives the ball from a long outlet pass on the left wing, just inside his opponent’s half. Instantly, he pirouettes to face the basket he’s attacking, and glides past his defender as if he’s not there, dreadlocks flowing as he drives towards the basket. As Hill enters the paint and rises to shoot, he’s fouled hard in the air by another defender with a clumsy attempt at a block. As he crashes to the hardwood he releases the ball, and watches it kiss the glass and fall through the net. The crowd goes wild, with high-pitched screams and shouts of ‘and one’ reverberating around the gym. Hill dusts himself off, his face betraying no emotion, and calmly knocks down the free throw before jogging to the other end of the floor. That piece of sporting brilliance didn’t occur in New York’s Madison Square garden or Los Angeles’ Staples Center. The screaming fans were Vietnamese, the stadium was in Hà Nội and the league was the Vietnam Basketball Association (VBA) League, not the NBA. Yes, Việt Nam has its very own basketball league, and in its second year, the VBA League has proved a hit, begging the question; is basketball poised to overtake football as the country’s favourite sport? 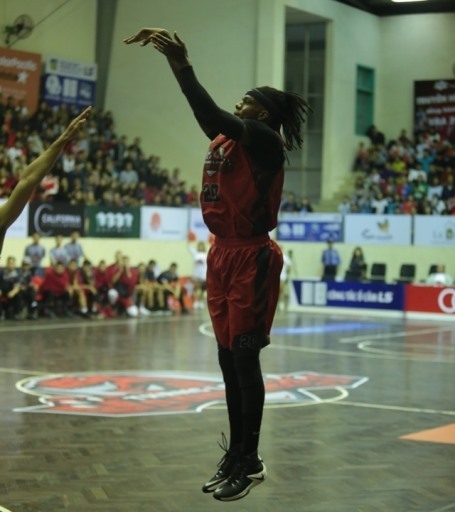 Hill’s three point play helped his team, the Thang Long Warriors, to an 82-57 win over their hometown rivals, the Hanoi Buffaloes, in the first game of the best of three semi-final series – a series the Warriors clinched three days later. The game on November 9 was played at Thang Long’s home Hà Nội University of Education Gymnasium in Cầu Giấy District, in front of a rabid, capacity and noticeably young crowd. The Warriors, much like their namesake Golden State, are far and away the dominant force in the league, having finished the regular season with a 12-3 record, three games ahead of the veteran Saigon Heat. Success came despite this being the team’s first year, a credit to coach Lee Tao Dana. The game played out with the Warriors in the ascendancy as expected, given the team had won all three regular season games against their crosstown rivals comfortably. The first quarter was particularly scrappy, with both teams feeling each other out and struggling to get their star men enough touches, and the Thang Long taking a 17-12 lead. The second quarter saw the Warriors flex their muscles, with power forward Hill growing more into the game and dominating the Buffaloes’ star Jason Carter, who at six foot nine failed to impose his will or stature on the game. The half ended with the Thang Long in control but not out of sight, holding a ten point lead at 34-24. Things only got worse for the Buffaloes in the second half, as a combination of costly turnovers and the Warriors’ rebounding prowess widening the gap. Hill, Justin Young and Nguyễn Văn Hùng controlled the paint, pulling down rebounds and putting up points, with an eight point run helping the home side to a 52-35 lead entering the final stanza. The fourth quarter of any basketball game is where the men are separated from the boys, and Hill didn’t fail to deliver in the final period. The Detroit native ground down the Buffaloes by consistently driving to the basket and coming up with points, putting paid to any hopes of a comeback. Hill finished as game MVP with a double-double, putting up 33 points and 10 rebounds, while Young and Tô Quang Trung chipped in with 13 and 14 points, respectively. The Buffaloes were led by Carter with a relatively paltry 13 points and 9 rebounds, with the big man struggling to make his size count in the paint. Everything surrounding the game was perhaps more intriguing than the contest on the floor. Though the level of play was low, with much of the game played in the paint instead of at speed around the three point arc as NBA fans are accustomed to, the crowd was enthralled. Fans wearing the colours of both teams cheered at every noteworthy play, regardless of who it was made by. Dom, a professional basketball coach from Georgia, the US, noticed this while watching the game. Having coached in Ha Noi for a few months and attended three Thang Long Warriors’ games, he said while the fans may cheer at strange times and the play may be scrappy, enthusiasm for the game here is unrivalled, even in basketball’s home in the US. This enthusiasm was driven by the large majority of young people at the game. Younger kids bashed together plastic sticks in Thang Long red as if trying to deafen everyone around them, while teens sporting NBA jerseys screeched excitedly in between sips of luminous blue drinks. Appealing to Việt Nam’s youth is clearly a large part of the VBA’s strategy to grow the game here. Each game is an event with activities all around it – with cheerleaders, contests for fans between quarters and the livestreaming of every match on YouTube. All of this appeals to the short attention spans of a younger generation, keeping them watching a product that frankly still needs some polishing. The VBA finals begin on Sunday (November 19) with the Warriors hosting the Cantho Catfish. Whichever side comes out on top in the series, Vietnamese basketball is the winner. Seven years ago the country didn’t have a single professional team; now it has six and a league of its own which regularly packs stadiums. The VBA’s biggest challenge will be maintaining this success once the novelty factor of watching a basketball game wears off for Vietnamese people, perhaps by upping the standard of play or by inducing more heated rivalries.